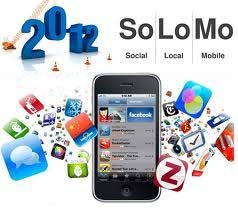 Martyn Collins Digital and Social Media Marketing Services: What do we mean by SoLoMo? What do we mean by SoLoMo? SoLoMo is the acronym or abbreviation for the three dominant features of marketing activity today. You need to be present and active in Social Media; the information you provide needs to have Local content and this all needs to be enabled to function properly on Mobile devices. The need for a SoLoMo strategy is dictated by consumers. Remember them? The people who decide whether or not you even have a business. The big opportunity for your business lies at this intersection of social, local, and mobile, how you embrace it and use it to your advantage. For example, if you're a hotel in a large city, potential customers may be very interested in what great night-life is nearby, or events that are being held. If you're a rural self-catering property giving information about great local pubs can be the difference between a booking and none! A Local business will know this, and sell the benefits of their locality. Being present, active and engaging in Social Media will not only pet people know that you are real, have a personality and are worth visiting; it will also massively improve your search engine visibility. Mobile has the advantage of using social context to enhance search. Google Search, plus Your World is one example of how this will work. As many people access the Internet via their smartphone as by laptops. If your business cannot be found on a Mobile search that potential customer will probably never become an 'actual' customer. As a consumer, where and when you are, and whom you are with, are all that matters. Each and every one of us is the center of our own universe. That’s the opportunity for marketers—to learn more about what is central to their customers and how their business can become integral to those experience. This year is the year for your business to embrace SoLoMo and, in doing so, meet the demands, preferences and expectations of your new customers.